The Hunley stuff has predictably stayed in the news, but, at least in terms of publishing, the Charleston Campaign as a whole has not received much love during the Sesquicentennial. Offhand, I can't think of any new major works showing up over the last two or three years. While the printed page may be shooting blanks, Craig Swain's To the Sound of the Guns website has been unleashing a constant stream of informative, well illustrated, and deftly written articles shedding light on various historical and material aspects of the Charleston Campaign. They jump around according to the author's particular interests, and those not sharing Craig's fascination with all things Civil War artillery may struggle to muster up enthusiasm for the series, but I appreciate his easy-to-follow accounts of obscure actions and raids and the lavish attention paid to quantitative detail. Christ: "CIVIL WAR ARKANSAS 1863: The Battle for a State"
1863 was a year of unmitigated catastrophe for Arkansas Confederates and their Indian allies. For them, it began with hints of impending conflict and ended with shattered armies and Union forces firmly in control of the Arkansas River Valley, including the state capital of Little Rock. Tactical aspects of the Little Rock Campaign have been recounted in book form before, and several good journal articles and chapter length histories of the fighting at Fort Smith, Arkansas Post, Helena, and Pine Bluff exist in the literature, but Mark K. Christ's new book Civil War Arkansas 1863: The Battle for a State is the first to relate these events as a cohesive whole, each defeat or victory building upon the next, the end result of which was a significant military and political victory for the U.S.
With the fall of Little Rock, Arkansas unionists, a significant bloc both active and passive in the state ever since the secession crisis, were able to solidify their power and influence over the vital Arkansas River Valley. The year long series of campaigns fairly crushed the Confederate military establishment in Arkansas, relegating to district control only a toehold in the southwest corner of the state. Additionally, hopes, faint as they realistically were, of obtaining lasting inroads into Missouri were also permanently lost (a fact only reinforced by the quixotic 1864 Price Raid). Before diving into his discussion of 1863, Christ provides readers unfamiliar with the conflicts in the region with a good background summary of the early war period in Arkansas and Indian Territory. His later chapter length accounts of the battles of Arkansas Post, Helena, Little Rock (Brownsville, Bayou Meto, and Bayou Fourche), the capture of Forts Gibson and Smith, and Pine Bluff are detailed enough to satisfy most readers. 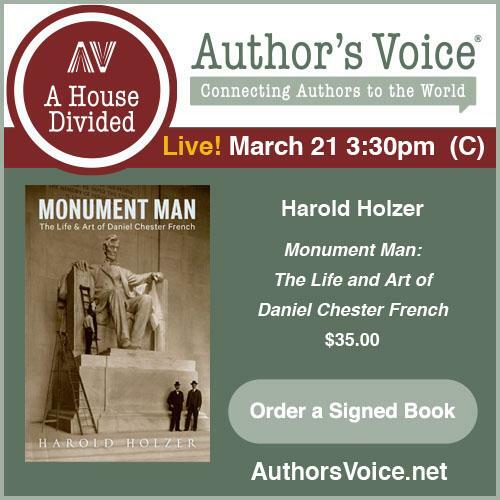 The book's content is tightly organized and the narrative deep, with Christ synthesizing well the existing literature as well as integrating and interpreting his own extensive manuscript research. The cartography is the weakest point of the study's presentation. With roughly one map provided for each of the chapters (several of which cover multiple engagements), they are too few and do not match the text's level of tactical and operational detail. The author's views of the abilities of the commanding officers and their roles in each campaign [Thomas Churchill, Theophilus Holmes, Sterling Price, Douglas Cooper, William Steele, and John Marmaduke on the Confederate side, and the Union army's John McClernand, Benjamin Prentiss, Frederick Steele, John Davidson, James Blunt, and Powell Clayton] are well considered and fairly conventional, with the federals as a whole putting in much better command performances than their opposing counterparts. However, Christ's assessment of General Price's abandonment of Little Rock being the only viable option for his army to undertake seems open to reasonable debate. The capital was fortified, and, even after the heavy Confederate losses incurred weeks earlier at Helena, the numerical disparity was not particularly overwhelming. Also, the division of Federal forces on both sides of the Arkansas River in their advance on the city need not have been necessarily fatal to Confederate hopes, and indeed might have afforded an opportunity for a counterstroke. On the other hand, the true state of the defenses seems to be an open question [at least this reviewer has not encountered in the literature a detailed description of the earthworks' quality and extent] and the sinking morale of the southern forces in the district may not have been up to a stiffer fight. In addition to his fine military narrative, Christ also does a good job of summarizing the shifting alliances of the tribes located in the Indian Territory, as they attempted to find the best means of self preservation amid frequent incursions by mixed white and Indian Confederate and Union forces. The impact of the 1863 military disasters on the political situation in Arkansas is also well developed by the author. Each major U.S. victory demoralized pro-Confederate civilians and emboldened unionists. The fall of Little Rock led a deputation of Pine Bluff citizens to request federal protection, and the well received Union officer sent there, Powell Clayton, later became a Reconstruction governor of the state. 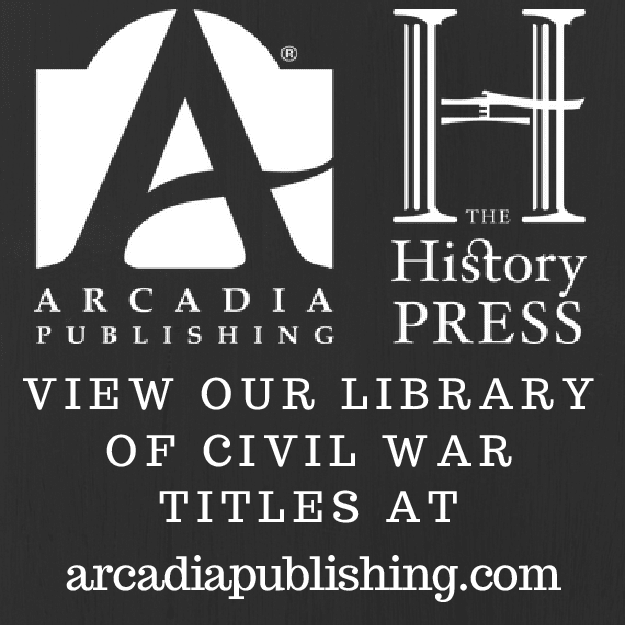 Civil War Arkansas 1863 is a notable addition to University of Oklahoma Press's Campaigns and Commanders series. 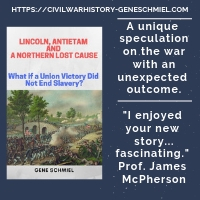 1863 proved to be the most decisive year of the war for the soldiers and citizens of Arkansas, and Christ's scholarly study is an excellent military and political exposition of why that was so. It is essential reading for students of the Civil War in Arkansas, and assumes a prominent place in the literature of the Trans-Mississippi theater as a whole. 1. St. Augustine and the Civil War by Robert Redd (The Hist Pr, 2014). The depth of research appears to be a cut above that typically found in local histories of this type, both in general and in comparison to others from the same publisher. If you didn't know already, Redd runs the Confederate Book Review website. 2. Civil War Arkansas, 1863: The Battle for a State by Mark K. Christ (Univ of Okla Pr, 2014). This is a new paperback edition of Christ's fine 2010 book. It appears to be a straight reprint with no new material. 3. The Battle of Peach Tree Creek: Hood's First Sortie, July 20, 1864 by Robert D. Jenkins, Sr. (Mercer UP, 2014). With the narrative part of the book more than 400 pages in length, this is a big battle study, the first of its kind for Peachtree Creek. My first impression is I like what I see. The bibliography is huge, heavy with primary sources, and the maps are acceptable in number and scale. Can't wait to delve in. Nichols: "GUERRILLA WARFARE IN CIVIL WAR MISSOURI, VOLUME III, JANUARY - AUGUST 1864"
Guerrilla Warfare in Civil War Missouri, January - August 1864 is the penultimate release of a colossal undertaking, author Bruce Nichols's four volume micro-history of the 1862-65 bushwhacking, jayhawking, and clandestine Confederate recruitment activities spanning every corner of the state. In keeping with the established geographical and temporal matrix developed in the two earlier books covering the years 1862 and 1863, Volume III at its highest level of organization categorizes events by quadrant (NW/NE/SW/SE) and season, with two additional layers shepherding the reader down to meticulously documented guerrilla and counter-guerrilla action. By most measures, the latter part of the 1864 period covered in the book represents the peak of guerrilla violence in the state during the Civil War. While it remains unclear how well coordinated the actions of guerrilla bands were with Confederate authorities headquartered in Arkansas, rumors and a high level of anticipation associated with the planned 1864 invasion of Missouri by the Confederate army led to substantial increases in both guerrilla violence and rear area recruitment drives by commissioned officers (their activities often shielded by local guerrillas). In terms of scale, the acts of violence described in the book run the full gamut, ranging from individual killings of soldiers and civilians on up to pitched battles between Union forces and bushwhacker bands numbering into the dozens and perhaps hundreds. A truly gruesome and tragic picture of the 'cycle of violence' that plagued Missouri emerges in the book's pages. On the Union side, a combination of Missouri State Militia (MSM), Enrolled Missouri Militia (EMM), and US volunteer regiments send to the state to bolster the local forces confronted guerrillas directly, but they also committed a long string of atrocities against unarmed pro-Confederate civilians. Jayhawkers from Kansas, and even Missouri Union soldiers on leave from other theaters, frequently killed civilians thought to be part of the guerrilla support network. On the Confederate side, guerrillas, who could not expect to be spared if captured, fought a take-no-prisoners conflict with Union forces, while also murdering pro-Union civilians in alarming numbers. Learning from 1862, recruiters tended to avoid conflict. One who did not heed the lesson was John Thornton, who initiated a premature uprising of his own in the false belief that Sterling Price's Confederate army was not long in coming. Thornton's small army of recruits, numbering in the hundreds and bolstered by deserters from the "Paw Paw Militia" (81st and 82nd EMM regiments), was largely broken up by converging Union forces. Thornton's attempt to "liberate" NW Missouri and the Union response to it are abundantly detailed in the text. The amount of research that went into the project is astounding. Every category of source material was judiciously consulted, but there's little doubt that no one has scoured newspapers and county and local histories to the degree that Nichols has done in order to assemble existing scraps of information on the state's guerrilla war. In recognition of the streak of unreliability that runs through such publications, the author diligently searched for corroborating material. Most of the endnotes contain a long list of citations, often numbering a dozen or more, as well as commentary. Maps, drawings, and photographs of individuals from both sides are abundant, but one wishes a better way to use visual aids to track locations and the flow of events had been devised for the series. The maps provided are basic and sterile, at the opposite scale of the narrative's micro-level action. The nature of the book is overwhelmingly descriptive. A consideration of the culpability of Union and Confederate leaders and policy makers for the behaviors of their representatives and supporters in Missouri is beyond the scope of the work. Similarly, high level guerrilla warfare analysis and interpretation like that found in earlier works by Micheal Fellman, Clay Mountcastle, and Daniel Sutherland (to name a few) is not part of the series's mission. However, Union attempts to develop better strategies to combat guerrillas, many of which Nichols credits to new department commander William S. Rosecrans, are presented and evaluated. These include the first generalized attempt to arm local civilian groups to protect their own communities [presumably, this was previously discouraged for fear of their weapons and ammunition landing in the hands of the enemy], pairing Kansas and Missouri units together in the hope that this would prevent indiscriminate civilian targeting, and foot patrols aimed at surprising guerrillas in their own camps. Nichols's work hasn't received a great deal of attention outside of Missouri specialists. That's a shame, because, among other things, it might prove incredibly useful in answering long standing questions about the war, one of which is numbers related. In Inside War: The Guerrilla Conflict in Missouri During the Civil War (Oxford University Press, 1990), Michael Fellman broadly estimated that perhaps 10,000 civilians were victims of Missouri's retributive cycle of violence. Nichols's ground level work spanning the entire state could very well prove to be a useful tool in arriving at a figure of civilian deaths based on actual evidence. 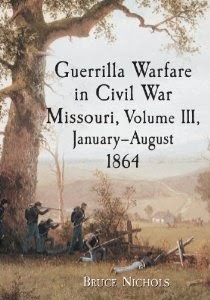 Series Volume III is a highly recommended addition to the historiography of Civil War Missouri, a must-have for the guerrilla war reference library. The quality of the series has been maintained throughout its entire run and interested parties will eagerly await the final volume scheduled to be published later this year. I believe the Butler Center for Arkansas Studies hasn't published a Civil War title since the 2010 essay collection The Die Is Cast: Arkansas Goes to War, 1861 so I can forgive myself for missing the soon to be released "This Day We Marched Again": A Union Soldier's Account of War in Arkansas and the Trans-Mississippi (also edited by Mark Christ). Like a number of recent T-M titles comprised of edited first-person source material, this one involves the immigrant experience, in this case the diary of Jacob Haas of the Sheboygan Tigers (Company A, 9th Wisconsin Infantry Regiment). Hunt: "COLONELS IN BLUE - INDIANA, KENTUCKY AND TENNESSEE: A Civil War Biographical Dictionary"
With his latest book Colonels in Blue - Indiana, Kentucky and Tennessee: A Civil War Biographical Dictionary, Roger D. Hunt has contributed to the Civil War literature yet another authoritative reference work of great worth to scholars and researchers. His previous publications include a photographic and biographical register for colonels commanding regiments from New York, New England, and the Mid-Atlantic states and a volume dedicated to brevet brigadier generals. With current publisher McFarland, he's released Colonels in Blue--Michigan, Ohio and West Virginia: A Civil War Biographical Dictionary (2011) and it's probably safe to say more are on the way. The book's highest level of organization is by state, in this case Indiana, Kentucky, and Tennessee. Under these are the regiment and biographical sections. The former is comprised of a listing of the state's militia and volunteer regiments, accompanied by the name(s) of the colonel(s) commanding and their appointment dates and fates (e.g. mustering out, promotion, wounds, death, etc.). The latter is the impressively thorough biographical register, or 'dictionary' as Hunt terms it. Each entry in the dictionary begins with a command and promotion summary for the officer, followed by date of birth & death, education, occupation(s)/offices/honors, and burial site. There is also a "Miscellaneous" section comprised of interesting information and trivia spanning the subject's life. A list of references is also conveniently placed at the bottom of each register listing. Finding photographs of some Civil War officers, even those with status as high as colonel, can be surprisingly difficult, but Hunt was able to track down one for most of his subjects. Judging from the bibliography's massive list of manuscript sources, government records, newspapers, and published works of all types, it's clear that Hunt's dedication toward finding every existing scrap of pertinent information has not waned over time. 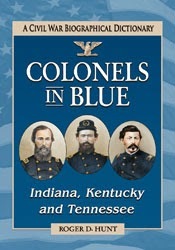 Colonels in Blue--Indiana, Kentucky and Tennessee is another invaluable resource dedicated to the men that commanded the regiments of the Union army, and those readers with a special research interest in Southern Unionist units will especially appreciate the focus of this one. This volume, along with all members of the Colonels in Blue series, is highly recommended. 1. Civil War in the North Carolina Quaker Belt: The Confederate Campaign Against Peace Agitators, Deserters and Draft Dodgers by William T. Auman (McFarland, 2014). This study extensively documents seven distinct campaigns fought against deserters, draft evaders, and the domestic anti-Confederate movement in the state. According to the author, the North Carolina peace movement headed by William Holden closely mirrored the northern so-called Copperheads in terms of their character and goals (e.g. federal reunion with slavery intact). 2. Bloody Autumn: The Shenandoah Valley Campaign of 1864 by Daniel T. Davis and Phillip S. Greenwalt (Savas Beatie, 2014). The latest entry from the Emerging Civil War series, this one takes on the 1864 Valley Campaign and its key battles of Winchester, Fisher's Hill, Tom's Brook, and Cedar Creek. Like the others, it is profusely illustrated with photos and maps. In addition to the narrative there are four driving tours and short pieces on Winchester history, the Front Royal executions, how the campaign has been remembered, preservation, and orders of battle.